This Hubble Space Telescope photo, released Feb. 2, 2012, shows a distant galaxy 10 billion light-years away (shown as) as it appears through the gravitational lens around the galaxy cluster RCS2 032727-132623 about 5 billion light-years away. The background galaxy appears 20 times larger and over three times brighter than typically lensed galaxies, NASA says. A fluke of astrophysics has revealed what scientists are calling the brightest galaxy ever seen through a cosmic "zoom lens," NASA officials say. The distant galaxy is 10 billion light-years from Earth and was spotted by the Hubble Space Telescope using a so-called gravitational lens created by a massive cluster of closer galaxies located about 5 billion light-years away. The distant galaxy is three times brighter than any other seen through a gravity lens, researchers said. "This observation provides a unique opportunity to study the physical properties of a galaxy vigorously forming stars when the universe was only one-third its present age," NASA officials explained in a statement released Thursday (Feb. 2). The universe is currently about 13.7 billion years old. 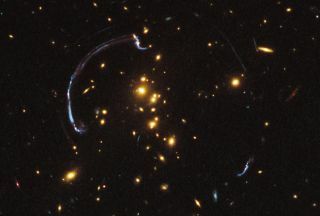 A gravitational lens is created when a massive object, like a black hole or galaxy cluster, falls in between an observer (like the Hubble telescope) and a more distant target in the background. This illustration shows how an image of a background galaxy is distorted and magnified by the gravitational field of a foreground galaxy. In this alignment gravity acts as a lens in space by warping space like a funhouse mirror. The image of a distant galaxy is stretched into a giant arc. Scientists rely on gravitational lenses in order to get a glimpse at the frenetic star-formation regions of distant galaxies in the early universe. Nearby galaxies tend to appear more mature and in the waning stages of star-formation, researchers said. In the new Hubble image, astronomers aimed the space telescope at the galaxy cluster RCS2 032727-132623, which is surrounded by a nearly 90-degree arc of bright light from an even more distant galaxy. Because of the gravity distortions, the image of the background galaxy is repeated several times — a hallmark feature of gravitational lenses, researchers said. "The challenge for astronomers was to reconstruct what the galaxy really looked like, were it not distorted by the cluster's funhouse-mirror effect," according to NASA's image description. This graphic shows a reconstruction (lower left) of what scientists call the brightest galaxy ever seen through a gravitational lens. The small rectangle at center shows the location of the background galaxy if the intervening galaxy cluster RCS2 032727-132623 was gone. The rounded outlines show the distorted images of the background caused by the lens. The astronomers used data from Hubble's observations to remove the distortions caused by the gravitational lens, revealing a view of the distant galaxy filled with star-forming areas that shine brighter than similar spots in our own Milky Way. "Hubble's view of the distant background galaxy is significantly more detailed than could ever be achieved without the help of the gravitational lens," NASA officials wrote. Astronomer Jane Rigby of NASA's Goddard Space Flight Center in Greenbelt, Md., led the team of scientists that obtained the Hubble view. Astronomer Keren Sharon of the University of Chicago led the study on the distant galaxy, which will be detailed in an upcoming edition of the Astrophysical Journal.